A look in the mirror reveals to you more signs of aging each passing day. It’s a process we all experience as we get older, but there are options you can choose to take years off your face. Looking younger means reducing most signs of aging like the “parentheses” lines on either side of your mouth, or the looseness around the jawline and under your chin. As your youthfulness fades, consider a facelift to restore the young and vibrant look you desire. The first step in the process is to choose a surgeon who is board certified and reputable. Dr. Cecil Yeung is a double board certified plastic surgeon in Houston who specializes in deep plane facelifts. Dr. Yeung was also the first Houston surgeon to perform the endoscopic facelift. Dr. Yeung’s facelift is known for its lack of pain and short recovery time after the procedure. His facelifts also give you the most natural and enduring facial rejuvenation available. Dr. Yeung prides himself on the fact that even he can rarely detect his own facelift closure line because he is so meticulous in how he performs his surgery. A facelift, also known as a rhytidectomy, is a facial plastic surgery procedure. The muscles and soft tissues under your face are repositioned to create a refreshed and rejuvenated appearance. This repositioning gives you a younger looking appearance when sagging and droopy muscles are tightened and moved. Any excess facial skin is trimmed and extra fat deposits are removed, resulting in your face having a more tightened appearance. This eliminates any sags, looseness, and creases from your facial area, giving you a smoother, highly contoured and firmer face that brings you back to a more youthful-looking age. What are the four top things to examine when considering a facelift surgeon? You are putting your face in a doctor's hands. It's important for you to get the results you desire by choosing a facelift surgeon who you feel confident about. Here are the top four considerations you should think about when choosing your facelift surgeon. Years of Experience: There is no replacement for years of experience. There are no shortcuts to refining a highly sophisticated surgical procedure over many years. You want a surgeon who has seen many, many cases and dealt with all different types of conditions. Being a great surgeon is not merely about schooling and technical skill, but also about keen judgment and the ability to make the right decisions when performing the procedure. You should choose a facelift surgeon who has many years of experience doing facial procedures. A doctor who has worked on many patients gives you the confidence that you are in good hands. Deep Plane Technique: When you have a facial procedure, the facelift surgeon repositions the muscle layer beneath the skin, then precisely re-drapes your facial skin over the relocated muscle. This repositioning deals with the underlying causes that were responsible for the sags in your face, reducing droopiness in both the muscle and skin. Many surgeons do not perform the deep plane technique because it is more difficult and more time-consuming. However, it is worth the time and the extra money because it will last in a way that a regular facelift (where the skin is simply stretched over the muscle) won’t. Natural Look: We've all seen plastic surgery that didn't look quite right, the overall look wasn't natural. To avoid this, it's important to choose a doctor that gives you natural-looking results for a fresh and normal facial appearance. The best way to assess this is to see a surgeon’s prior work. Long-lasting Results: When you choose a doctor who can give you long-lasting results, you are making a decision you’ll have to do the procedure only once. You don’t want to have repeated procedures that aren’t necessary - you want it done properly the first time. Since your youthful appearance is enduring when done by an experienced doctor, you'll only have to undergo the procedure one time. Where can I find a top facelift surgeon in Houston? 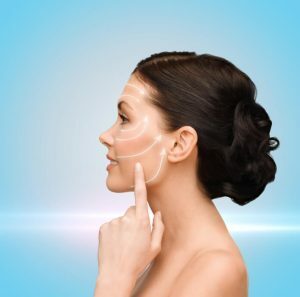 Dr. Cecil Yeung is one of the most skilled and practiced facelift surgeons in the Houston area with an excellent reputation for consistency and innovation. He is renowned for - before anyone else - performing the endoscopic facelift in Houston. He also is one of the very few surgeons to perform the deep plane facelift in Houston. Through Dr. Yeung’s precise surgical methods, he has built a reputation for his results to be long-lasting and with shorter post-op recovery times. Dr. Yeung’s facelift procedures are typically conducted at the Yeung Institute’s ultramodern, fully accredited surgery center located at his office. At the center, you will receive the best of patient care in a deluxe, well-appointed, private and comfortable setting. No need to deal with the lack of privacy or headaches of a hospital or large facility. If you want to explore your options for achieving long-lasting and natural-looking facial revitalization, contact our office today. You can start the process by filling out the appointment request form right on this page.